Abraham, Carolyn (March 26, 2013). 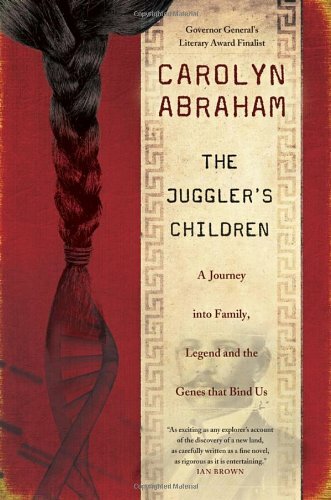 The Juggler's Children: A Journey into Family, Legend and the Genes that Bind Us. Published by Random House Canada. 400 pages. ISBN 978-0679314592. From the publisher's book description: "Abraham investigates whether this burgeoning new science can help solve 2 mysteries that have haunted her multi-racial family for more than a century"
The Juggler's Children is about the Canadian author's "dance between DNA and documentary evidence, science and paper" as she sets out to uncover the mysterious origins of two of her great-grandfathers, one of whom she inherited her surname from ("the juggler"). At the beginning of the book there are two family tree charts, one for the descendants of each of these great-grandfathers who married and fathered children in India but originally came from somewhere else (China and Jamaica, probably). In hindsight I should have drawn another family tree chart for the Crooks family in Jamaica as I read what her research uncovered there, as it was not so easy keeping up with the Crookses, but I was in too much of a hurry to find out what happened next. I guess it could not have been included in the book without giving too much of the story away. Even though my 100% European ancestry is not nearly as interesting as the author's, I can identify with so much of what she wrote having similar family mysteries of my own to solve. Regardless, I am a sucker for a good detective story. I also learnt some history, geography and science in the process. The book would also be a good primer for a "genetic virgin". It discusses genetic genealogy in layman's terms and illustrates the various pitfalls of genetic testing and analysis via the author's personal story. Her experiences demonstrate the limitations of both science and paper, and hence the value of using both to corroborate each other. Abraham is a science writer and wove various milestones in genetics and genetic genealogy into her story. However, science has already progressed somewhat since the Abraham family undertook genetic testing. There is now greater emphasis on testing autosomal DNA inherited from both parents and the costs have dropped substantially. Pioneers of genetic genealogy are impatient, and this book gives us some perspective in that regard. The writing style is well balanced, not too dry given the scientific subject and not overly verbose. The book contains plenty of humour, puns, metaphors and phrases that made me smile such as "typos" regarding mutations, "kiss and tell" regarding the Y chromosome and "old boys' club" regarding Y haplogroups (not having my own Y, I can really identify with that one). The Juggler's Children is currently available in Canada.